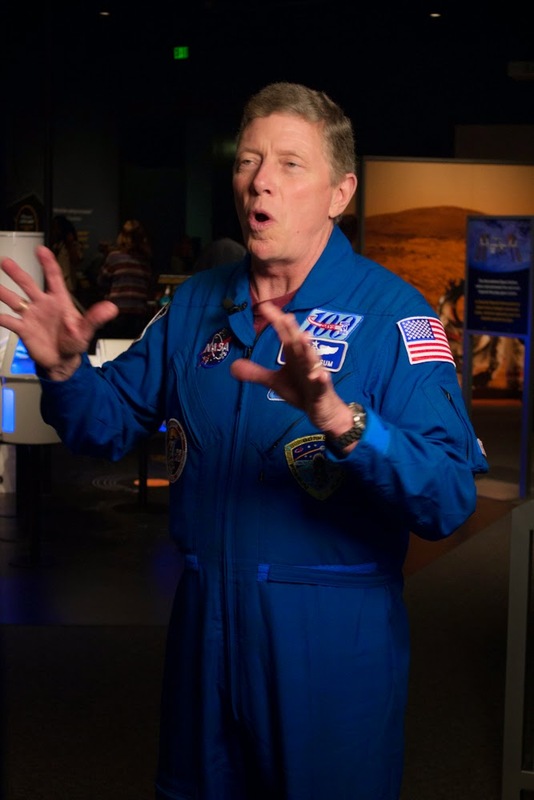 NASA astronaut Mike Fossum is in St. Paul this week to help launch the Science Museum’s new exhibition, “SPACE: An Out-of-Gravity Experience.” If you’ve ever thought that being an astronaut is all glamor and glory, “SPACE” will disabuse you of that notion. It’s hard, exacting, dangerous and sometimes smelly work. And yet there are men (and women) who dream of going into space and eventually become part of what is truly an elite group. 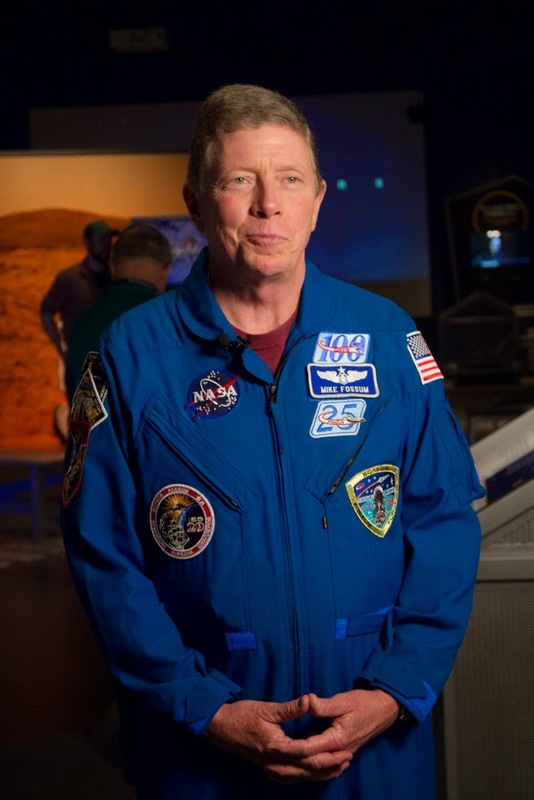 Mike Fossum is one. He grew up poor (he didn’t tell us he’d grown up the grandson of sharecroppers, but we overheard him telling someone else), he prayed, he tried and tried again, and now he’s one of the few. To be honest, it was a thrill to speak with him. I’m not often star-struck, but I was around him. PLE: How long are you in St. Paul? 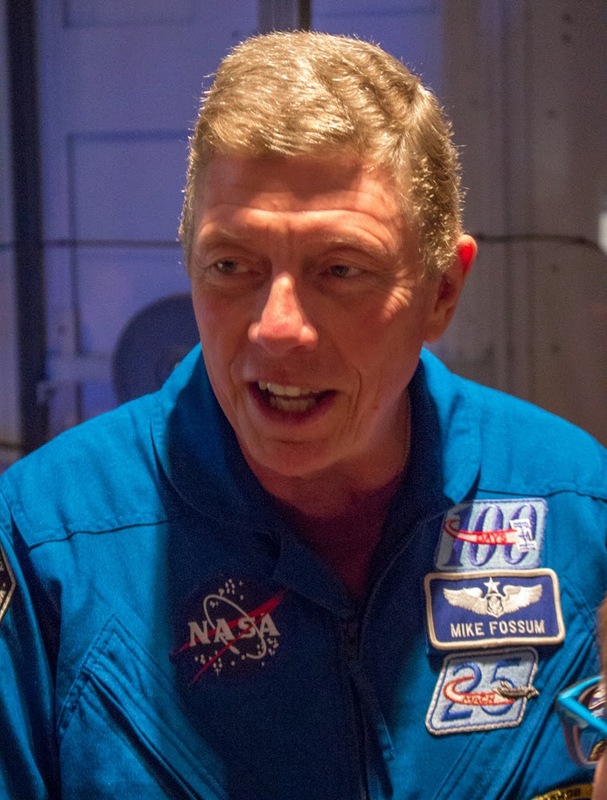 Mike Fossum: I’m just here for a few days. The main events are today, associated with the opening of the new exhibit. Then back home, back to Houston. Did I hear you say you were ready to return to the Space Station again? I am ready. I have a chance. We’ll see. My doctors and my wife are conspiring against me. I was reading your biography and learned that you have traveled some 77 million miles in space. I can’t get my head around that. It’s kind of hard to even imagine. But you make enough trips around the planet – sixteen a day – and they add up over 194 days. And now I realize I’m talking to a real astronaut and my mind has just gone blank. [Laughs] I’m a normal guy with an outrageous job. I’m in the generation where we followed everything the astronauts were doing. We watched the launches in school. And now it seems like there’s almost an indifference to the space program. What would you say to people to get them excited about it again, or at least pay attention? Come to see [the “SPACE” show at the Science Museum]. Hear President Kennedy giving us his challenge to go to the moon, which was an outrageous challenge – we had barely launched rockets, to go to the moon in that amount of time took huge national resources, and we know there were geopolitical reasons for doing it, too. Then come through and see some of what the space shuttle program did. It was built to deliver big pieces of space stations to space, and it finally did it. Then see what we’re doing now with the space station, some of the science exhibits that are in here. Then dream about where we’re looking for the future. Can you see yourself on Mars? There will be human footprints on Mars someday. I hope that there’s an American flag on their shoulder. About motivating kids: In a lot of ways, they think space is impossible. I was born in Sioux Falls and grew up in one of the poorest parts of the country, down on the Mexican border in South Texas. This was an impossible dream for me, too. I found a way to get through college – it took an Air Force scholarship to help me pay for college, then the Air Force gave me opportunities to go to graduate school, and then I worked in flight test and went to test pilot school. I tried to take the best advantage of my opportunities – to study hard, to do well, to stand out as one of the best. Maybe motivating school kids to study the science, technology, engineering, math, the STEM fields … but it’s not just about grade school kids. All of us are inspired by this. We did an astronaut selection about two years ago, and we had 6,000 people apply to be astronauts. These are people at the peak of their professional careers. They’re in math, science, engineering, medicine. There were teachers and test pilots. All are working their hearts out to be the best that they can be, and this is one of the things that’s inspiring them. I know it inspired me to reach a little deeper, to dig in and try a little harder to be the best, to be as good as I could be. All of these people want my job. And there are people who don’t want my job, but they want to be part of something that’s big, huge, outrageous. Putting mankind, putting humans on Mars is an outrageous challenge. And it is hard. We do need the financial support to do it. And the nation has a lot of priorities for how we spend our money. I recognize that. I’m not saying it should be budgeted differently. I can’t make that claim. But it’s the reality of what we do. But there’s a lot of good that comes from space, too. We’re learning so much now. We have over 2,000 different scientific investigations completed on the space station. Some are to help us develop systems that support the people that keep us healthy for a six, seven or eight month trip to Mars and back again. Some are to research what’s going on here. The classic one is osteoporosis, bone loss. Without gravity, you begin losing bone ten time faster than a 70-year-old osteoporotic woman. We find that with the right exercise regimen – I came back [from 164 days in space] with essentially no change to my bones and muscles. I exercised, and I also tested a medicine. With the accelerated effects in space, you can test a medicine that would take a long period of time to investigate and prove side effects, prove benefits on the ground. How many astronauts are there now? There are only 42 active astronauts right now. We have eight junior guys in training that aren’t yet certified as astronauts. That’s down. Not that many years ago, we had 135 astronauts. We were flying 30 to 40 a year in the space shuttle. Right now we’re flying four a year on the space station. It’s a longer grind. It’s a two to two-and-a-half year training flow for a six-month mission. Shuttle missions were about a one-year training after you completed all of your initial training to get ready for assignment. When you’re not flying, we’re all very, very busy. We’re supporting the development of the Orion capsule, which we tested back in December with great success. That’ll be our exploration vehicle to go further, beyond Earth orbit. I’m supporting the real-time operations on the space station right now. I work with crews in training, I work with the crews on orbit, I work with the mission control team and the mission managers as we’re juggling priorities, working through challenges. There are big meetings going on right now to see if we’re ready to do a space walk tomorrow, for instance. If I was in Houston, I would be doing that. I’m involved with those kinds of things. Boeing and SpaceX are two companies that were selected to build human ships to get us to and from the space station so we will no longer be reliant solely on the Russians and their Soyuz space craft. That’s a good thing. The Russians have been great partners. There’s a lot of other challenges right now, including with our partnership, but we’re fortunate to be working with them. I was a cold warrior. I spent the first half of my career as a cold warrior. Now I’m speaking Russian and walking across Red Square at will – not speaking Russian real well, but I can get by. It’s a dramatic change to the way things were. It’s an example of where we can cooperate and work together. We have 15 nations all bound at the hip, that are working together on this, and we need each other. The U.S. and Russia can’t walk away. The space station cannot function without both of us. We both bring critical things to the mission that have to be there to continue the mission. In some ways, you could say, “Boy, what a dumb decision,” but in other ways, that’s how we saved some money, saved some costs, and we’ve got to find a way to get along. If you think about Earth as a spaceship, wouldn’t it be better if we just had to find a way to get along and resolve issues? Because it’s just imperative. Instead, we sit across borders and cause trouble with each other. Out of all your high moments, and there have been many, what stands out for you as the highest? For me, it was the first launch. I applied to over seven selection cycles over 13 years. I interviewed five times before I was selected. That set a record. Five interviews was a record. Somebody’s tied it. It’ll be hard to beat it, and I don’t wish that on anybody. I have a passion to pursue this. Beyond passion, for me, it’s a calling. It’s a spiritual calling, that I was supposed to reach in this way. I never felt any guarantee that it would work out the way I dreamed it would, that I prayed it would. What faith, if you don’t mind my asking? I was Missouri Synod Lutheran. After all of those years – 13 years of applying, the years before that dreaming, but now getting serious about it, working my heart out, trying to do as well as I could do in the educational opportunities and career opportunities, being selected as an astronaut – we had an accident that slowed things down, and it was eight more years from the time I was selected until I was strapping in. Columbia. And so now, finally, it’s the Fourth of July in 2006, we’re sitting on the pad, we’ve had a couple of [delays] due to weather, but now it’s looking real, the weather’s good and the systems are coming up. There was some down time and I took a nap on the launch pad, sitting on four million pounds of explosive rocket fuel. I took a nap because I could feel the prayers lifting us up, and I felt – okay, I can release it for just a few minutes here. I took about a 15-minute nap, and then it’s “Hey, Mike, wake up! We’re getting close!” Because you’re rush, rush, rush, and you’re in there, and now it’s like, what do you do? There’s some time built in for that purpose – not naps, but in case they need to work on communication or something. So. Here we are. The engines come to life. I’ve dreamed about it forever. This ship that is now a living beast, you can feel it rumble as the main engines come to life. They do a quick gimbal check of them, and you can feel that – the ship itself does kind of a twang, it pushes over because the engines are at a little bit of an angle, they’re doing some quick checks in just a few seconds. But I couldn’t just sit there and go “Wow,” I had a job to do. My job was to jump out of my seat quick as I could, grab still and video cameras and get to the window. We needed to get pictures of our external fuel tanks as they floated away, looking at foam damage to see if we’d been hit by any big pieces. The tank wasn’t in view yet, so I’m sitting there looking out the window of the shuttle at the North Atlantic, and there’s this blue ocean with a dappling of white clouds, an impossibly black sky, and this curved horizon with a little thin band of atmosphere that’s very visible. And I realized with a shock, this isn’t a picture, this is not a video, it’s my eyeballs looking through some glass at God’s creation down below. And I thought, this is what it looks like when God’s looking down, and I said a prayer of thanks for making the dream come true, for getting us here safely, and – now I’ve got work to do, there’s the tank. I hope you get to go back.